German-Americans represent the largest group of immigrants arriving in the United States in all but three of the years between 1854 and 1894. Before the end of the century more than 5 million Germans had arrived and in the twentieth century another 2 million came. They came from a wide geographic area and for a variety of reasons. They were a highly diversified group in terms of regional origin, religious and political orientation, education and socioeconomic standing. Although conditions in the German states were not as bad as in Ireland, crop failures, inheritance laws, high rents, high prices, and the effects of the industrial revolution led to widespread poverty and suffering. Relatives and friends who emigrated first would write back and encourage others to follow. This led to "chain migrations" and group settlements. Fairly well-to-do farmers who saw a bleak future, poor ones with no future, paupers whom the authorities often paid to leave, revolutionaries after 1848, and many artisans, professionals, and some adventurers made up the spectrum of the German-American immigrants moving to the land of opportunity in the 1840's and 1850's. 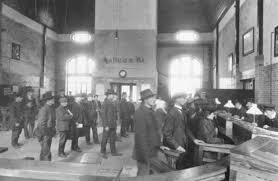 Because they stood out from earlier immigrants, the 18th-century German-American Immigrants were the first large immigrant group to suffer from the fear and suspicion of those who had been here before and demanded that they assimilate into an existing culture. Because the German-American Immigrants resisted changing their customs or their language just to accommodate a new land, some Americans saw them as a threat. In fact, Benjamin Franklin complained that Pennsylvania was in danger of too many German-American Immigrants and their potential to inundate everyone else. He wrote in 1751: "Why should the Palatinate Boors be suffered into our settlements, and by herding together establish their Language and Manners to the Exclusion of ours? Why should Pennsylvania, founded by the English, become a Colony of Aliens, who will shortly be so numerous as to Germanize us instead of our Anglifying them, and will never adopt our Language or Customs". Paper Masters writes custom research papers on German-American Immigrants and discuss hoe papers can be ordered from Paper Masters and are custom written every time.